Toes peek over the precipice as your heart is pounding between deep breaths. The muscles aching, the tender about-to-burst blisters lining your sole, the relentless cycle of hunger and thirst — everything melts away as you reach a summit with a view few people get to see. In our over-connected world, it’s easy to forget that places like this exist. Places without wifi or roads, where your own two feet are the only reliable form of transportation. So, if you’re looking to put some definition on those legs, here are seven treks around the world with views jaw-dropping enough to make you forget the pain it took to get there. The bottom line: A popular trek in a remote location that delivers grandiose mountain peaks with guest houses providing lodging and hot meals throughout the route. This trek winds from village to village through the Gandaki valley leading up to the base camp of Annapurna, the world’s tenth tallest mountain. 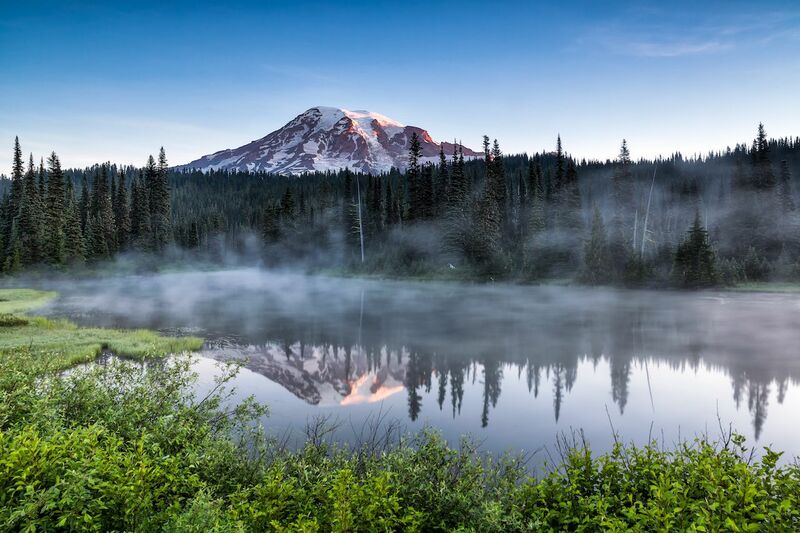 Over the course of 9 days, you’ll hike from bamboo forest to alpine valley. While you’ll start seeing the fishtail-shaped peak of Machhapuchhre from day two, save some battery life for day five when you enter the Annapurna Sanctuary, a glacial basin ringed by snow-dusted peaks measuring over 23,000 ft. Altitude sickness is a real concern on this trek, so stick to gaining about 1,000ft per day once you’re above 10,000ft. The bottom line: This overnighter is great for those with limited time who want to have the experience of sleeping beside a glacial lake under a star-filled sky. 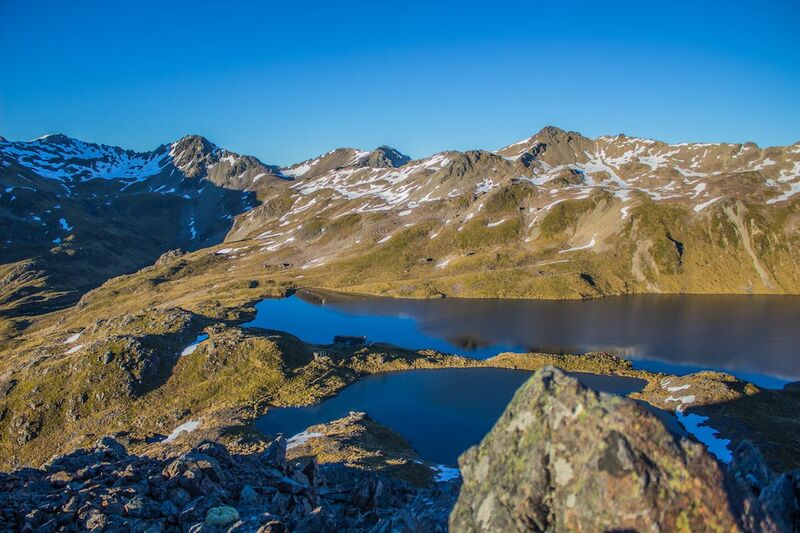 The South Island’s Angelus Hut sits on the edge of a glacial lake at 5,400 ft above sea level. There are two routes up — each taking about 6 hours — which allows for an alternative in case of bad weather or just a change of scenery on the way down. The Pinchgut track will have you scrambling over the Robert Ridge route’s scraggly rock piles high above the expansive Nelson Lakes National Park, while the slightly less dramatic Speargrass track includes several river crossings and small waterfalls. Beware the skin-slicing speargrass bushes that gave the route its name! The hut itself has 28 bunks and only the most basic amenities so you’ll need to bring cooking supplies and a sleeping bag. If the night is clear, bundle up on the deck for some starry evening entertainment. As for most treks in New Zealand, reserve a space ahead of time during high season. The bottom line: Adventurers looking to experience the solitude of the Drakensberg Mountains with no frills or shelters. 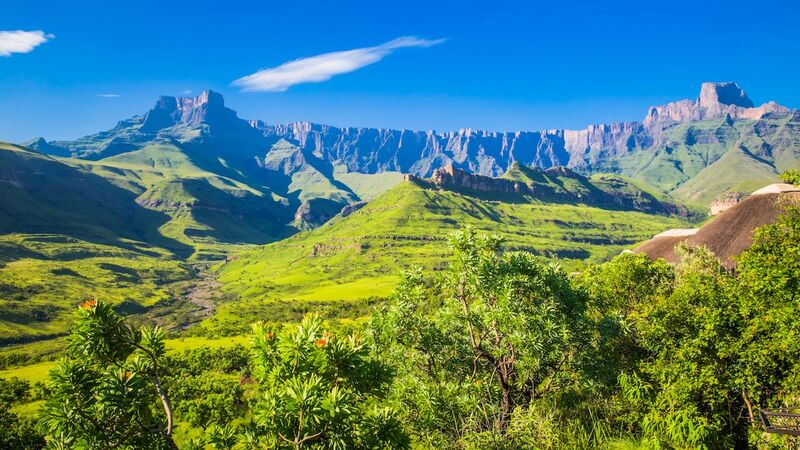 If staying in villages and guest houses sounds too fancy, this trek in South Africa’s Drakensberg Mountains will satisfy any hikers looking to be self-sufficient in the wilderness. In this section of the popular mountain range, a cutback path will have you feeling like you’re the only person left on the planet. The path is strenuous, to say the least, but you’ll be picking your jaw up off the ground when you see Mpongwana (AKA the Rockeries Tower), the most celebrated peak of the region. Don’t miss out on the chance to camp in one of several caves available near the trail if you really want to get that post-apocalyptic feeling. The bottom line: If you want some serious bragging rights, live out of your pack for this life-changing 5-month trek that spans the length of the US. Introduced to pop culture by Cheryl Strayed’s Wild, the Pacific Crest Trail is the ultimate entry on thru-hiking bucket lists. Most trekkers take about 5 months to finish, starting the trail in the desert of Southern California and ending in northern Washington. That’s 5 months of hiking, on average, twenty miles a day. So, yeah, not for the faint of heart (or busy of schedule). But for those five months, you’ll have a front row seat to the best views the United States has to offer including Mt. Rainier, the Klamath Mountains, and the High Sierra. For those who want a taste of the thru-hiker life without the time commitment, try out the shorter John Muir Trail or do the overnighter to Stehekin, Washington, a remote lakeside town with only 75 inhabitants and one hell of a bakery. The bottom line: History buffs and thru-hikers unite on this trail that passes from village to village in the culturally-rich landscape of central Lebanon. If you want a hearty dash of culture with your trekking, head to Lebanon to hike the country’s national trail. 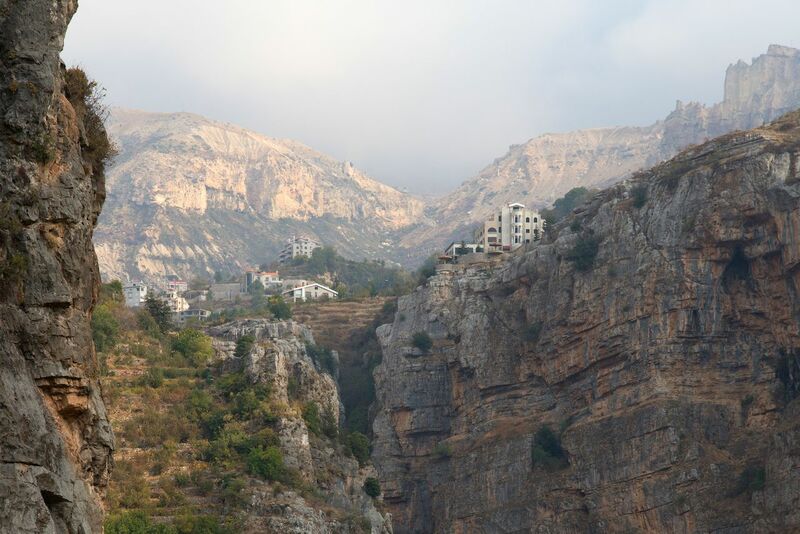 With a grant from USAID, the Lebanon Mountain Trail Association forged this trek to promote environmentally and culturally ethical travel in the remote central region of Lebanon, an area neglected by most visitors. The trail allows you to spend each night in a different village, where local guest houses provide homegrown food, simple accommodation, and insight into Lebanese life. It’s recommended you hire a guide in each village who can then accompany you to the next, ensuring security and plenty of conversation. The bottom line: For those interested in exploring the quieter side of Europe — but still want to eat a lot of cheese and bread! 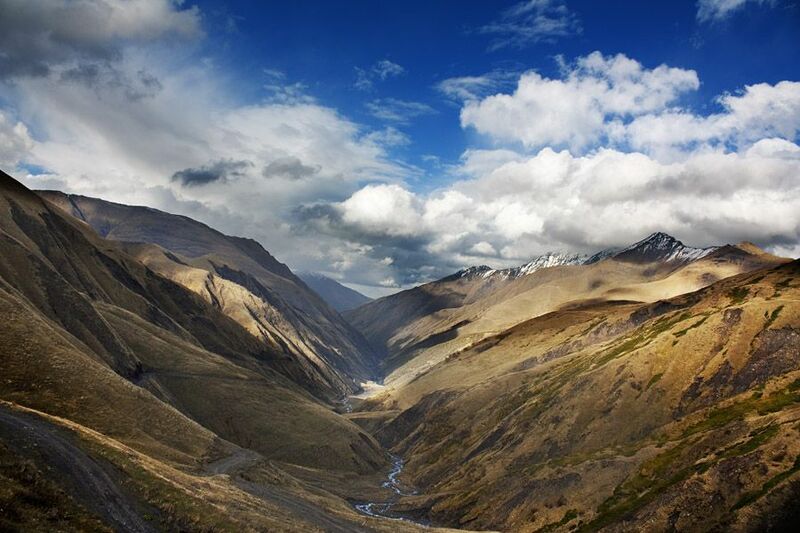 — trek shepard paths through the Georgian Caucasus Mountains in the remote Tusheti region. While the Alps are more famous, the Caucasus Mountains hold the record for the tallest peaks in Europe. On this five-day trek in Georgia, you follow ancient herding paths through alpine pastures leading to Medieval villages ringed with imposing stone towers. Plagued by poor roads, this hard-to-access region receives few outside visitors despite its rich culture and time-worn traditional lifestyle. Trek from the village of Omalo to Shatili, traversing the Pirikita range and Nakle-Kholi pass for endless views of undulating hills. Camp along the route or stay in the villages where you can have a hot meal of Khachapuri, homemade bread filled with Georgian cheese. Be sure to take out enough money for the trek (plus emergencies), there are no ATMs in Tusheti. The bottom line: Trade in mountains for sand dunes in the northeastern region of Brazil where you can hike in socks through a unique natural phenomenon of lake-scattered desert. 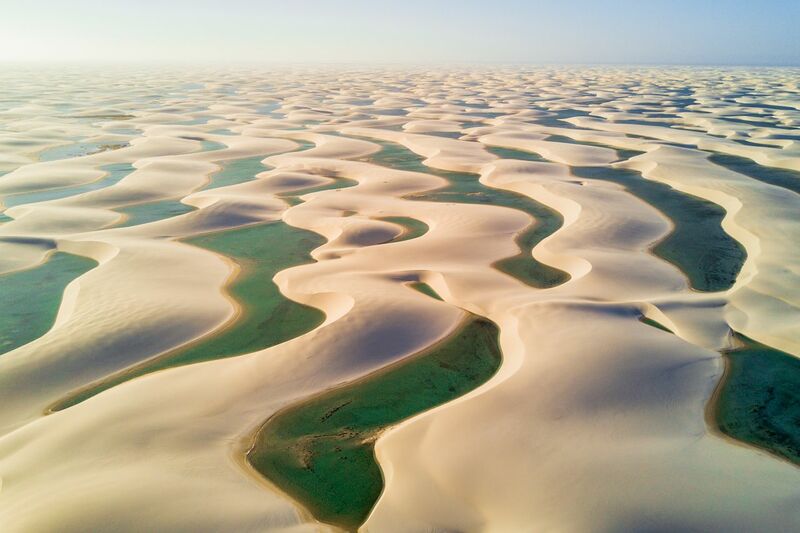 After heavy rain storms from January through June, lakes of aqua blue water gather in the dips and folds of the white sand desert of Lençois Maranhenses National Park. Spend five days trekking through this contrasting landscape, dipping in the refreshing pools when the Brazilian sun gets too hot. Your trekking day will start in the moonlight of early morning to avoid any movement in the midday sun, so you’ll have the afternoon to laze and explore. It’s easier to hike the dunes without shoes, so ditch the boots and bring plenty of socks.